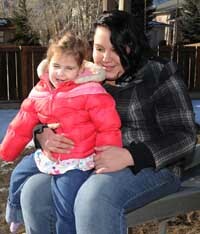 Cecelia Farley sits at the kitchen table of her apartment in Hailey's Woodside subdivision and watches her friend Marissa cuddle Cecelia's 3-year-old daughter, Delilah. "Marissa's the baby-whisperer," she says. "She's a miracle worker." Delilah and Cecelia certainly need a miracle, but sadly, a slightly bigger one than Marissa's magic can conjure. "Delilah can't communicate," Cecelia, 20, says matter-of-factly. "She's lost purposeful hand movements. She used to put puzzles together and play with cars—now she doesn't play with any toys. She has seizures and heart attacks." Delilah has Rett syndrome, a rare genetic neurological disorder that occurs almost exclusively in females. The syndrome manifests itself after 6-18 months of early normal development (in Delilah's case, at 11 months), and rapidly causes developmental regression, leading to lifelong impairments. "Basically it's like she's forgotten how to do the most basic and simple things," Cecelia says. "And it won't stop. Every time she learns something new, she forgets it, and then she'll forget something else that she's known how to do her entire life. She used to eat—sushi, French fries, fruit—but she forgot how to chew and how to swallow." Rett's is often misdiagnosed as autism or cerebral palsy and currently has no cure. Those inflicted with the disorder have no purposeful hand use due to constant, repetitive hand movements, hand-wringing and mouthing. Speech is lost, seizures develop and scoliosis (curvature of the spine) occurs. Irregular breathing patterns, hyperventilation and breath-holding take place. More than half the girls and women lose their ability to walk. Delilah never had the chance to learn to walk. In addition, she is now almost completely blind and has the mental ability of a 4-and-a-half-month-old. Delilah began life a perfectly normal, healthy baby, but when she was 11 months old, Cecelia noticed her eyes starting to cross. "She was also late with her milestone, so we had people come to do evaluations. She was slow and she wasn't talking, not even trying. She was smaller and losing a lot of weight." When Delilah began to have episodes in which she wouldn't breathe, Cecelia sought a specialist's help. But the neurologist who saw Delilah was unable to diagnose her, and Cecelia was told, "We may never know what's wrong with your daughter." Finally, Delilah's physical therapist suggested that she see Dr. Nancy Mann, a behavioral therapist in Boise. By this stage, Delilah was constantly moving her hands and putting them in her mouth, a classic symptom of Rett's. As luck would have it, Mann had recently read an article on Rett's, which is still a largely unknown syndrome—despite the fact that it is the leading cause of severe impairment in girls. She ran some tests, and on March 8, 2011, gave Cecelia the diagnosis. Caused by a mutation on the X chromosome on a gene called MECP2, Rett's strikes all racial and ethnic groups, and occurs in one in every 10,000 to 15,000 female births. Rett's causes problems in the brain function that is responsible for cognitive, sensory, emotional, motor and autonomic function, and is most often misdiagnosed as autism, cerebral palsy or nonspecific developmental delay. It is classified as an autism-spectrum disorder. Initially, doctors told Cecelia that her daughter would likely not live past her seventh birthday, and in the last few months, Cecelia has had to perform CPR to restart Delilah's heart six times. Subsequent doctors have dismissed this idea, saying they can't really tell where Delilah will be in a year, let alone seven. And hers is a special case, as she may be the only girl to have this particular form of Rett's. "Delilah is so different and her mutation is so severe that they don't know what's going to happen. But we know her heart and brain aren't growing, and her body is, too quickly for her organs to cope with, so her kidneys are failing," Cecelia says, showing a few cracks in her previously composed manner. "She's going to have to have a feeding tube soon because she doesn't get much of her bottle anymore, and she has a heart murmur that gets worse every few months or so. Her heart just doesn't produce the energy her body needs—that's why her muscle tone is so low and she can barely crawl. But she's pretty tough—she's my superhero. She's stubborn—I think that's why she's still kicking." Delilah yells out to her mother in seeming agreement. "She yells all the time," Cecelia says. "It's the only way she can talk." Delilah's rare genetic mutation has caught the attention of Katie's Clinic at Children's Hospital & Research Center in Oakland, Calif., one of the few places in the United States specializing in diagnosis and comprehensive care of Rett syndrome. The Farleys will visit Katie's Clinic next week in the hope that it will shed some light on Delilah's particular case, as well as show Cecelia therapies and techniques to improve Delilah's quality of life. But she needs a New Year's miracle for the trip to work. The family leaves on Thursday, Jan. 12, for the clinic. Cecilia is hoping that Medicaid will cover Delilah's medical expenses, but she's still trying to find a way to cover the costs of their flights and accommodations for the two-day trip. She estimates it will cost $2,000. Various small fundraisers have failed to raise the funds she needs and her plan to take a loan on her tax return just fell through. Anyone wishing to make a donation to the Farleys' travel expenses can do so through Mountain West Bank in Hailey or Ketchum, where an account in the name of Delilah Farley has been set up. Checks can be deposited in person or mailed to Mountain West Bank, 206 Main St., Hailey, ID 83333. To make a donation to aid research for Rett Syndrome in general, visit www.rettsyndrome.org.